People often say, “Marriages are made in Heaven”, giving full credit(or blame) to the God Almighty, conveniently ignoring all the permutations-combinations, manipulations-machinations, we mere mortals have to endure to woo a suitable life-partner! And, to make the journey even more tedious, the Indian lovers often have to pacify their parents as well to accept their choice in the most personal agenda of their own lives! Courtesy Karan Johar and Chopra clan, the run-away tendency of young lovers is on the back-burner these days, with every effort being made by the couples to sweet talk their parents into acceptance mode, allowing themselves to be scrutinized at the minutest possible physical, social, financial levels. The present book under review, ‘When The Signal Turns Red’ by Jayanand Ukey, that I received from the author, a few days back, in a sweet mild manner gives voice to this exact predicament faced by today’s youth, who are financially independent and yet sensitive enough to achieve a compromise between love and parental happiness. The protagonists Girish Khedekar and Prajakta Chitre are qualified engineers, ready to join much coveted MNCs, madly in love with each other. They plan to marry after at least five years, so that they have a hefty bank balance and enough moral courage to convince their respective parents. However, a love sms ruins their secret affair, and in an unprecedented manner, the clandestine romance comes into broad daylight, exposing them to the vigilant parents. Though, I expected a vehement opposition from the strict army man, Mr. Chitre, nothing untoward happens. After initial hiccups, in the very first meeting, everything is settled and even the engagement is fixed. As the sceptic in me smirked on the smooth sailing, the couple hovered on cloud nine, building love castles in air. But,soon a twist is introduced, the dwindling world economy plays spoilsport, and Girish loses his prospective job. As the coveted offer was the green card to Chitre’s stony heart, would Girish be able to marry his lady-love or would he become an easy victim of a single downward phase in stock markets! The novel in its 200 odd pages, explores Girish and Prajakta’s tryst with destiny and love. Initially, I was a little baffled by the constant hammering of employment over riding finer nuances of love. Fed on pulp fiction and SRK movies, the die-hard-romantic in me could hardly sympathize with the materialistic attitude of the characters. However, as I read on, Jayanand’s inclusion of small details of real family life changed my outlook. The first declaration of love in front of parents, the initial hesitation of both parties, the hurried conversations about wedding plans, were executed in wondrous way. Girish’s parents came across as loving ones, who took pride in his achievements, wished to marry him to no-less-than-a-princess, and yet were ready to compromise their own egos and dreams for the sake of their son’s happiness. 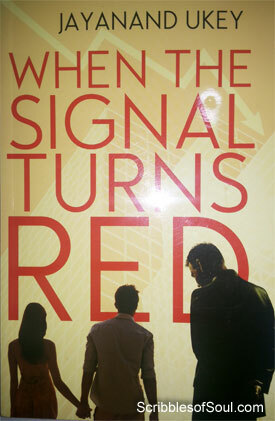 In a sudden flash, I realized that “When the Signal Turns Red” is not just a staple mushy-mushy love story. Rather, it is a true portrayal of the humdrum existence of middle class families. Be it the over-time put in by Mr. Khedekar to earn more money, or the quite sacrifice of Mrs.Khedekar in sharing her husband’s responsibilities, by paying home loan EMIs, or the very fact that in Khedekar household, every night, Girish converted the living room into bedroom, only to restore it back to its glory early next morning, are some of the incidents that gave a very real feel to the story. Most of the events seem to be lifted straight from a middle class household. My interest was revived in the story, despite a nagging feeling at the back of my head, that some more drama is needed to pick up the pace of narrative. And, lo and behold. Jayanand seemed to be reading my thoughts, as after a staid beginning, the story picked up incredible speed in the second part. Prajakta comes into limelight, another alliance is forged, and she successfully runs towards her goal with a steady aim. The entry of another suitor wakes up Girish from his stupor and after a slight dud, the romance is back in air, complete with clandestine meetings, bold professions of love and a full-blown Hindi movie climax in the third part. The story that began with a good intention culminates in an entertaining paisa vasool saga. Though, I would have preferred a more terse narrative, especially in the beginning, and a little less emphasis on TV News, the novel did not disappoint. Just a little pointer though, the plot of Madan and his ex-flame could have been explored a little more, to add to the dramatic appeal. Nevertheless, a good debut by Jayanand Ukey, redefining the bad phases of life as mundane red signals, which can surely be turned green, with a little effort and lots of perseverance!